When searching for an appropriate credit card, there’s plenty to take note of to ensure you get what you’re looking for. Or better yet, what you need. One of the most important features of a credit card is the APR, or annual percentage rate. Put simply, the APR is the interest rate for your shiny piece of plastic. This number determines how much you’ll pay in interest, assuming you don’t pay off your credit card balance in full each month. So if your credit card APR is 20% and you carry a balance, you’d pay $20 for every $100 you charged (using basic math). Yikes! Yes, credit card interest rates are sky-high, which is why you should never carry a balance if you don’t have to. Many credit card issuers offer promos to get us in the door, with cash back rewards and “introductory APR” probably the biggest draws. The reward stuff is pretty self-explanatory, but what about the intro APR? What’s that all about? Well, as the name implies, it is an interest rate that is offered on a promotional basis for a certain period of time when the credit card is opened. The most common variety are “0% APR credit cards,” which tend to be offered for 12 months or longer. Some issuers such as Citi and Discover also have 0% APR offers for as long as 18 months. And there was a time not too long ago when a few daring credit card companies offered 0% APR for a full 24 months! The introductory promotional APR can be further broken down into “purchase APR” and “balance transfer APR,” which are also important distinctions. If the credit card offers 0% introductory APR on purchases, it means you won’t be charged interest on any purchases made during the promotional period. So if a credit card comes with 0% APR for 12 months, you can make purchases and carry a balance without worrying about finance charges (interest) stacking up for an entire year. After the intro APR “runs out,” so to speak, you’ll either need to pay off your entire balance in full or face costly finance charges. 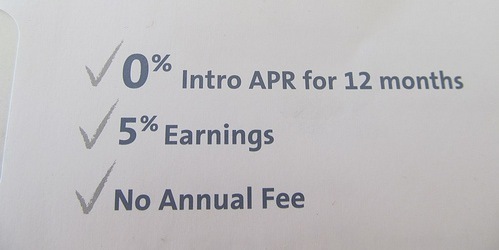 A credit card that offers introductory 0% APR on purchases may be a good choice for someone who wants to purchase a high-ticket item, but doesn’t have the cash on hand at the time of purchase. Or simply want to put off paying it for a while. Think a new computer, TV, or some other pricey item you may want to purchase now, but pay off slowly over the next year. You could buy a TV for $2,400, and make $200 payments each month for a year without paying a dime in interest. For the record, the store selling the TV would probably offer a similar financing deal, but such offers are notorious for being a rip-off once the intro APR period ends. Say you spend $1,000 during the first billing cycle (month) on your new 0% APR credit card. Instead of having to pay off the entire balance within your credit card grace period to avoid paying interest, you can make just the minimum payment and pay nothing in the way of finance charges. Why? Because the APR is set at zero, so even if you carry a balance, the interest rate is 0% and thus won’t accrue any interest whatsoever. Remember, any number multiplied by zero is always zero. However, after that promotional period is up, your credit card APR will shoot up to the standard purchase rate, which will likely be significantly higher than 0%. In fact, you could see your interest rate jump to the high teens or 20% range. Once that happens, you’ll be stuck paying interest on any balance you continue to carry over. This is “where they get you.” Credit card issuers essentially bank on you racking up debt that you can’t pay off in its entirety. However, if you are a responsible borrower that doesn’t let your spending spiral out of control, this type of card can be very cost efficient, and allow you to leverage your money if you need to use it for other more important things, such as existing high-APR debt. But perhaps the biggest benefit of a 0% APR credit card is the ability to transfer balances from other high-interest credit cards. For example, why pay 20% APR on a store credit card when you can move the entire balance to a new 0% APR credit card, then slowly pay it down for 12 months with zero interest? It makes no sense to keep paying interest when there are plenty of no-cost alternatives available, assuming you’ve got good credit. If the 0% APR credit card you’ve got your eye on also offers 0% APR on balance transfers, you can move existing debt to the card and save a ton of money that would otherwise go toward paying finance charges. Once the debt is transferred to the 0% APR credit card, you will avoid any and all interest until the 0% promotional period ends. This is a perfect time to make regular payments until the balance drops to $0, ideally before the introductory 0% APR period ends. With regard to balance transfers, 0% APR is often the main draw of executing one. So a credit card issuer will offer new customers 0% APR if they move their existing credit card debt to them. For example, if you have a $3,000 credit card balance with Chase, Citi or another card issuer may try to tempt you with a 0% APR balance transfer. If you take them up on the deal, your APR on the transferred amount would be 0% during the introductory period. This means you wouldn’t have to pay any interest during that time, but once the 0% APR expired, the balance would be subject to the purchase APR. This is “where they get you.” Their goal is to eventually have you carry a balance with them instead of your previous credit card issuer, and pay them interest. These 0% APR balance transfer credit cards are great for those who have high-APR credit card debt, as it gives you time to pay it down without interest piling up. If you are unable to pay off the debt in full by the time the interest rate shoots up to the standard purchase APR, you can execute another credit card balance transfer to a new credit card, and extend that 0% interest rate for another 12 months or longer. Keep it mind that you still ultimately need to pay off whatever you spend, as the debt is simply being shuffled from one credit card to another. That brings us to “fixed rate credit cards” and low interest rate credit cards, which above all are favored for their safe and secure fixed rate. The fact that the interest rate, or credit card APR, doesn’t change for the life of the balance transfer is a big plus, especially if you secure a super low rate. These offers typically carry no associated balance transfer fee either, which for some may be the selling point. But fixed rate credit cards do carry finance charges, which though relatively small, can add up over time. Imagine a credit card balance transfer that offers a 2.99% fixed rate for the life of the balance. This means you can hold the balance for as long as you’d like until it is paid off, paying only 2.99% APR. That’s certainly a good deal, and much better than the standard APR on credit cards which typically falls into the teens or higher. But those finance charges can still catch up to you. If you have a $5,000 balance on the fixed rate credit card with the 2.99% APR, you’d be paying roughly $150 a year, not accounting for accrued interest or early payoff. So even though you may have avoided a balance transfer fee, the finance charges alone would double the average balance transfer fee cost in as little as 12 months. Is 0% APR Good or Evil? In summary, intro APR is a great marketing tool for the credit card issuers and also a good way for cardholders to save some money. But it can also be a trap and lead to overspending. After all, the credit card issuers aren’t stupid, and sure as heck aren’t giving away free money. They must be winning or such offers wouldn’t exist. So make sure you know what the APR is (or will be) in all situations to avoid any unwanted surprises. And never spend beyond your means. If you stay on top of your finances you can save money with these offers and even pay down your debt in the process. Most things aren’t inherently good or bad; they just need to be approached responsibly. Read more: Pros and cons of credit cards. They’re sure good at roping in customers with these 0% APR offers you never have to pay back…oh wait, you do, usually after accruing a ton of debt that can’t be paid back anytime soon. Mission accomplished. I’m looking for a credit card with a long 0% APR. What’s the longest currently?